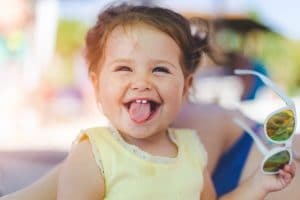 A frenectomy is procedure which removes a small piece of connective tissue and is usually performed on young patients to prevent mouth, gum, and tongue issues forming as they grow. A frenectomy is a common procedure performed in our Memphis periodontal office. Many younger patients have frenectomies to correct mouth, gum, and tongue issues early in life, while others only access this kind of treatment later. We’re ready to help you deal with any frenal issues and move forward. A frenectomy is the safe and gentle removal of a frenulum, which is a small piece of connective tissue. When a frenulum is overgrown or too short, it can restrict movement. There are several frenulum on the human body, particularly in the mouth, and conditions commonly affecting patients are typically referred to as a tongue tie or lip tie. A frenectomy can free the restriction caused by the connective tissue, resulting in a more pleasing aesthetic appearance, and allowing normal movement of the tongue and lips. Any soreness or pain caused by stretching of the frenulum is also negated. The frenulum under the tongue is designed to restrict how far out of your mouth you can stick your tongue, and also prevents you from swallowing your tongue. When this frenulum is too tight, it prevents patients from being able to move their tongue properly, which can cause speech and eating issues. There are also frenulum connecting the gums to the lip in the front center of the upper and lower mouth. These can also cause difficulty with eating and speech, and may be extremely visible when smiling or talking. Often, lip ties cause frenal pull, which can cause the gums to pull back from the teeth. A frenectomy completed in our Memphis periodontal office is generally done swiftly and gently by Dr. Godat or Dr. Craddock using a laser, and recovery time is only two to three weeks. Most patients experience little discomfort and can request sedation dentistry if they are anxious about the procedure. Contact us today for a consultation and to learn more about the frenectomy procedure.